How can small cities make an impact in a globalizing world dominated by ‘world cities’ and urban development strategies aimed at increasing agglomeration? This book addresses the challenges of smaller cities trying to put themselves on the map, attract resources and initiate development. Placemaking has become an important tool for driving urban development that is sensitive to the needs of communities. This volume examines the development of creative placemaking practices that can help to link small cities to external networks, stimulate collaboration and help them make the most of the opportunities presented by the knowledge economy. The authors argue that the adoption of more strategic, holistic placemaking strategies that engage all stakeholders can be a successful alternative to copying bigger places. Drawing on a range of examples from around the world, they analyse small city development strategies and identify key success factors. This book focuses on the case of ‘s-Hertogenbosch, a small Dutch city that used cultural programming to link itself to global networks and stimulate economic, cultural, social and creative development. It advocates the use of cultural programming strategies as a more flexible alternative to traditional top-down planning approaches and as a means of avoiding copying the big city. Greg Richards is Professor of Placemaking and Events at Breda University and Professor of Leisure Studies at the University of Tilburg in the Netherlands. He has worked with numerous national governments, national tourism organizations, cities and regions on a wide range of placemaking projects. Lian Duif was responsible for directing the Bosch500 programme in ‘s-Hertogenbosch from 2010 to 2016. She has a professional background in the field of tourism, cultural heritage and city marketing. 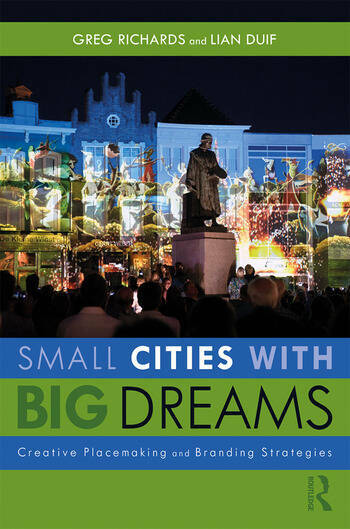 Lian is involved in the marketing and development of tourism and cultural programmes with organizations such as the Netherlands Board of Tourism & Conventions and VisitBrabant.